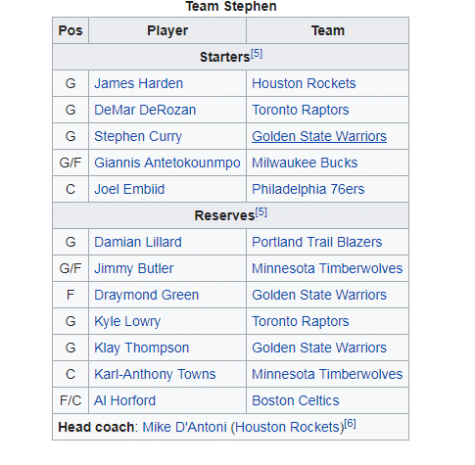 The 2018 NBA All-Star Game was the 67th edition of an exhibition basketball game that was played on February 18, 2018. It was held at Staples Center in Los Angeles, home of the Los Angeles Lakers and Los Angeles Clippers. It was the sixth time that Los Angeles had hosted the All-Star Game and the first time since 2011. The captains the All-Star game this year were Stephen Curry, from the Golden State Warriors, and LeBron James, from the Cleveland Cavaliers. The coaches this year were Mike D’Antoni, from the Houston Rockets, for team Stephen and Dwayne Casey, from the Toronto Raptors, for team LeBron. The rosters for the All-Star Game were selected through a voting process. 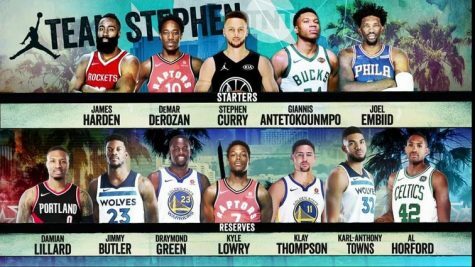 The starters were chosen by the fans, media, and current NBA players. Fans make up 50% of the vote, and NBA players and media each comprise 25% of the vote. NBA head coaches vote for the reserves for their respective conferences, none of which can be players on their own team. Each coach selects two guards, three frontcourt players, and two wild cards, with each selected player ranked in order of preference within each category. If a multi-position player is to be selected, coaches are encouraged to vote for the player at the position that was most advantageous for the All-Star team, regardless of where the player was listed on the All-Star ballot or the position he was listed in box scores. LeBron James and Stephen Curry were named as captains due to being the leading vote from the East and West, respectively. James had the first pick in the draft as the leading vote overall, while Curry has first choice of jersey color, due to the Western Conference having home team status for the game. 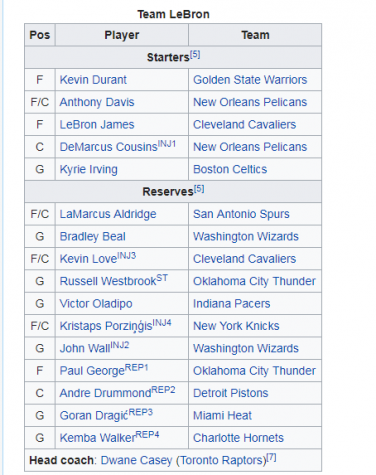 The draft pool consisted of the eight other starters, with no regard to conference designation, and 14 reserves (seven from each conference), chosen by NBA head coaches.On January 25, 2018, LeBron James and Stephen Curry created their rosters via a draft. 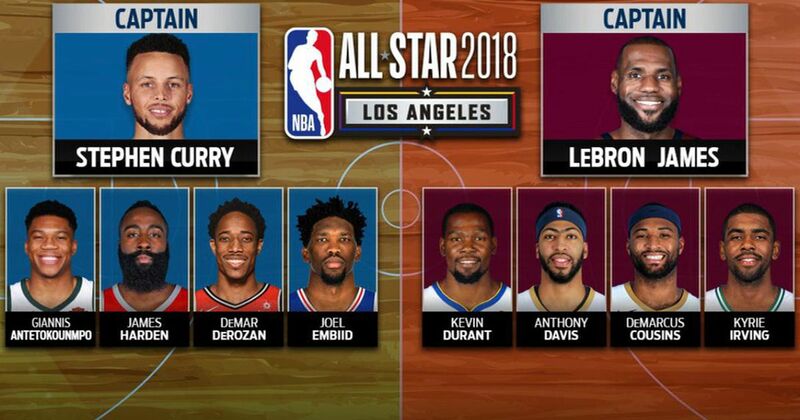 NBA Commissioner Adam Silver will select the replacement for any player unable to participate in the All-Star Game, choosing a player from the same conference as the player who is being replaced. Silver’s selection would join the team that drafted the replaced player. If a replaced player is a starter, the head coach of that team will choose a new starter from his cast of players instead. 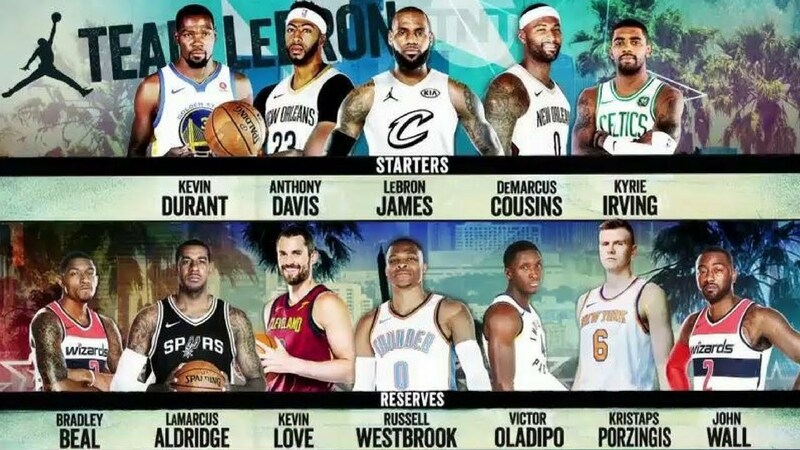 Team LeBron had three people that couldn’t play due to injuries.John Wall, Kristaps Porzingis, Kevin Love, and DeMarcus Cousins couldn’t play in the All-Star game due to injuries to the leg.In the end team LeBron won against team Stephen 148-145. LeBron James got the All-Star game MVP scoring 29 points, 10 rebounds, and eight assists, making it the third time he has won the All-Star MVP award.